An unexpected update was provided yesterday in the February Sneak Peek thread on the D3 forums: a Civil War event is coming up this Thursday without a character release. We should get word on the rewards before the event starts on Thursday. 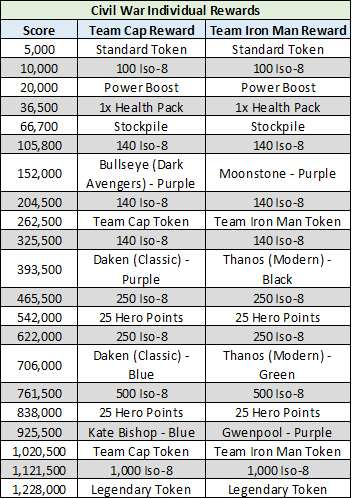 The weekly boost list was provided as well, but these boosts won’t be applied to Civil War which has its own unique boost list separate from the weekly one. A small additional update was that the upcoming Versus Event will be Vision’s Made Man (that will be using the above boost list!). We expect more information to come in as the Civil War event approaches. We will update this post once we learn more! Individual rewards, progression rewards and boosted characters have all been provided here.